A simple Progressive-bet for Baccarat! 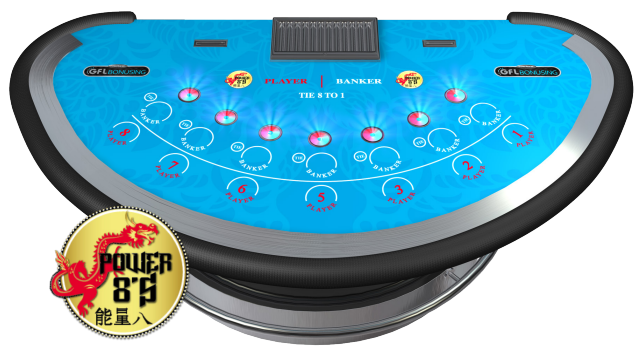 Baccarat Power® 8’s is a Progressive-bet offered for Baccarat, which can be played in addition to an initial wager on either Player or Banker, by placing a bet on the associated flashing pad. In Baccarat Power 8’s, Players bet on the combination (suit) and frequency of 8’s dealt, either as part of the initial 4 card deal or from the total of drawn cards representing a result in the main game. The three top Progressive Jackpots are shared equally between all those who placed a bet on the winning flashing pads. Baccarat has long since been one of the most popular casino table games in the world. With the new Baccarat Power 8’s Progressive-bet, casino operators can now capitalize on Baccarat’s popularity by encouraging more wagers, which ultimately results in increased revenue. Baccarat Power 8’s is sure to ignite excitement in both seasoned and new Baccarat Players alike.